​20 years ago this month, the board at Southport were concluding their search for a new manager. Brian Kettle had led the Sandgrounders to Northern Premier League success and on to creditable finishes in the Vauxhall Conference before making way for the experienced Billy Ayre and his well thought of assistant Steve Joel for the 1995/96 season. After Ayre’s unexpected departure to Swansea Joel was quickly instilled as manager in his own right in time for the start of the 1996/97 season. Although a popular figure, Joel was unable to translate his off field support and popularity into on field success and after some poor results, the last of which was a 5-1 hammering at Northwich Victoria on 20th December, the search for his successor began. Amongst the favourites was Peter Davenport who had been asked to fill the caretaker manager’s role in the interim and after picking up a couple of wins it appeared he had a good claim. Instead the board made a surprise appointment and chose a different former football league striker in Ronnie Moore. On the eve of the twentieth anniversary of that appointment I caught up with Ronnie to reflect on his time in management and his brief spell in charge of the Sandgrounders. 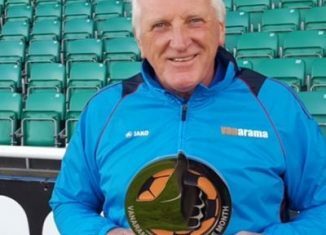 Interview with Ronnie Moore, conducted on 6th January 2016. You chose Southport as the club at which you would start your managerial career. What made you choose the Sandgrounders? I will be forever grateful to Chairman Charlie Clapham and Southport Football Club.They kick started my managerial career which is now past 900 league games. Although my time there was brief the whole club has a family feel about it. It opened my eyes regarding full-time training and part time training – we trained Tuesday and Thursday evenings. I decided to do a running session on a Tuesday night. One of the lads was miles behind so I gave him a right mouthful about being lazy not trying, then he informed me he had been climbing up and down a ladder all day working as a bricklayer. No wonder he couldn’t run – lesson learnt! Your first game in charge was a potential banana skin tie in the FA Trophy away at Halesowen Town. It was a game in which we won 2-0 thanks to a brace from Andy Whittaker. How did you prepare for your first game in charge? You left shortly after the end of the season after 31 games in charge to take over at a former club of yours in Rotherham United. You went on to spend a very successful time there, did you feel like your spell in charge at Haig Avenue helped towards that success and how was the challenge different to your time with the Sandgrounders? I left because I had the opportunity to Manage in the football league -. the added bonus was that I had played at Rotherham United. I scored over 50 goals in 110 games or something like that. I had built up a bond with the Club but more so with the Supporters, they loved me and I certainly loved them. It was a match made in heaven. Training everyday helps develop the bond more with the players, I had a great learning kerb with Southport, but the time [was right] and the club I was going to manage was massive. After spending a lot of time managing in the football league you’ve since returned to this level and managed in the conference again. What changes have you seen at this level in that time? There are a few changes at National League level. The number of Full Time teams now has made it a hard league to get out off, there should be 3 up and 3 down. Also the money around at this level is a lot more than I thought. I think the teams with the biggest budgets will be the ones who get back into league football. In terms of sides with a big budget in our division, you had a successful playing career at one of Southports big football league rivals Tranmere Rovers, something that a number of our older fans were very aware of upon your appointment. Did you at any time feel like you had to win anyone over? Ronnie is currently in between jobs having left Eastleigh at the end of 2016 but we wish him every success for the future and thank him for taking the time to talk to us. I still look for their results every time they play , it was great to see everyone connected with Southport when they came to Eastleigh just recently when I was manager there. I had a great chat to Chairman Charlie Clapham before and after the game, he is still the same person now has he was when I was there, he loves the club , they also got a lucky draw haha. Thanks for all your help Chairman.